Twilio’s communications platform has added over 50 Text-To-Speech (TTS) voices thanks to Amazon's deep learning-based Polly service. Amazon Polly offers lifelike synthesized speech across various languages. “You can select the ideal voice and build speech-enabled applications that work in many different countries,” says Amazon on Polly’s page. By Ryan Daws, 07 August 2018, 0 comments. Categories: Amazon, API, Platforms. Popular crypto data website CoinMarketCap has launched a ‘professional’ API which offers enhancements over its standard API. The new API is the result of a lot of inbound requests for CoinMarketCap’s data from developers and provides "additional endpoints, more calls, higher rate limits, exchange and market and historical data for the commercial tiers." By Ryan Daws, 02 August 2018, 0 comments. Categories: API. Twitter is taking a stricter approach to how developers use its APIs in addition to the removal of 143,000 apps failing to be compliant with its policies. Starting with a new application process, developers will need to first apply for a developer account using the portal at developer.twitter.com. Prospective applicants will need to provide detailed information about how they intend to use Twitter’s APIs before they’re provided access. By Ryan Daws, 25 July 2018, 0 comments. Categories: API, Platforms, Social media. A comment left by a Google engineer suggests the company is preparing a switch to the Vulkan graphics API for its UI rendering. The engineer’s comment was posted on the Chromium gerrit instance with regards to a bug report for the upcoming support of Vulkan in the Chrome browser for Android. Currently, Google still partly uses Skia for its graphics rendering – a 2D engine used for Chrome, Chrome OS, Android, and more. By Ryan Daws, 19 July 2018, 0 comments. Categories: Android, API. Apple appears to be cracking down on the use of a hybrid graphics API which is a cross between Apple’s proprietary Metal and the open source Vulkan. MoltenVK allows developers to use Vulkan in their programs, but the library then makes Metal API calls allowing the apps to run on iOS and macOS. Apple has refused to update a game from an indie studio which uses MoltenVK. By Ryan Daws, 09 July 2018, 0 comments. Categories: API, Apple, Gaming. By Ryan Daws, 03 July 2018, 0 comments. Categories: Advertising, API, Facebook, Platforms. Google has announced a biometric authentication API which enables developers to improve the security of their apps. Biometrics has become a favoured and quick security method for users. While there are certainly more secure methods of authentication, few are so fast and unintrusive. By Ryan Daws, 22 June 2018, 0 comments. Categories: Android, API, Hacking, Platforms, Security. A notice of OpenGL’s deprecation in Apple’s documentation has game developers threatening to abandon the company’s platforms. 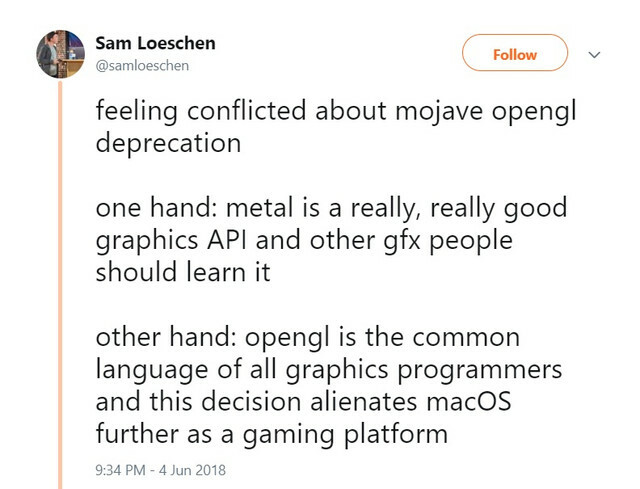 OpenGL has been a tried-and-trusted library for cross-platform game developers for decades. Up-and-coming APIs like Vulkan and Apple’s own Metal offer promising alternatives, but many projects still use OpenGL. By Ryan Daws, 07 June 2018, 0 comments. Categories: API, Apple, Development Tools, Gaming, iOS, Mac, Platforms. Arm is best known for its mobile CPU and GPU processors, but the company is keen to also show its expertise in more emerging fields. This week, Arm unveiled its new Project Trillium machine learning processor (MLP), three months after first revealing its existence. By William Judd, 23 May 2018, 0 comments. Categories: AI, API, Development Tools, IoT, Mobile, Tablet. After more than three years of development, AsteroidOS has finally reached the version 1.0 milestone. This open source smartwatch OS is designed to offer Android Wear owners an alternative, especially for older watch models that have stopped receiving Wear OS updates. By William Judd, 17 May 2018, 1 comment. Categories: Android, API, Ecosystem, Mobile, Wearables.